Cupidon is French for cupid, so with fluted legs, and a nice plump cushion, I can absolutely see a little winged creature sitting upon it. 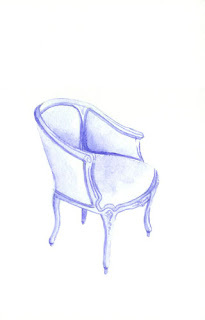 The chair has an aristocratic, 18th-century feel to it, and would spirit away any room. Of course, a classic bust of the winged victory would look fab perched in a nearby corner. And pink, I see pink. 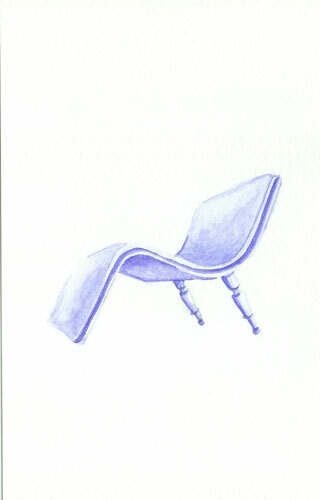 a fireside chair having a low seat and a high back. 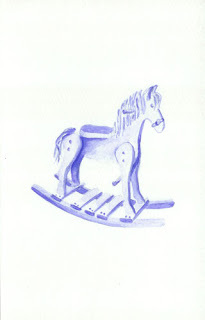 Well we just had to include a rocking horse chair on this blog, didn't we? This four legged chair is carved form oak, and has a nice soft mane and tale. Giddy-UP! Sweet chair. Curvy and inviting. Bonfire of the vanities. This is half of a pair of Mr. and Mrs. Wing chairs Offered through Brunschwig and Fils. 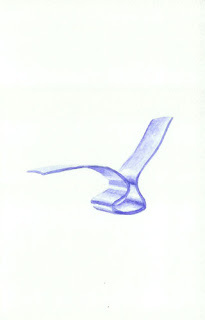 This is the Mr. half, with the square cut top of the curve of the wing. 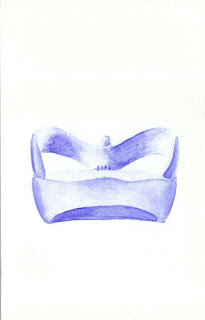 The Mrs. chair has a rounded top wing. Love the big nail head trim on both halves. 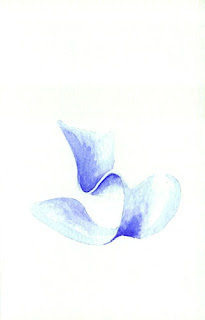 Reminds me of a wishbone. You know, make a wish at Thanksgiving, and pull each side with your pinkies? Well this is a three-way wishbone. Finn Stone has developed a range of amorphic chairs such as this one made from fibreglass and polyethylene. He is currently one of the UK's leading furniture makers, and he is extending his creative design flair into jewelry, ceramics and even clothing. 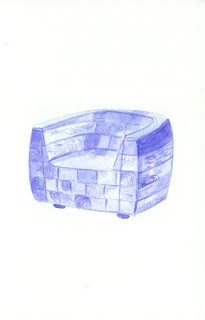 His furniture has been compared to the styles of Eero Aarnio and Vernon Patton. And it IS divine, dahhling. Vincent Cadena's philosophy is simple: "Design should pay homage to the past, while embracing the future." I think he got that retro glam thing down. A couture furniture, on average, comprises 60 different sections of materials and metal that require 12 separate production stages. Every procedure is invariably carried out by hand during a production process that demands approximately 19 hours of work for each single furniture and the involvement of at least 5 specialist craftsmen. 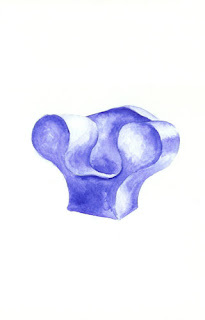 Marijn van der Poll design studio is a multidisciplinary design studio. Working for clients or independently we create exclusive designs such as one-off automobiles and unique furniture pieces which have been displayed around the world in renowned galleries and museums such as the Victoria&Albert Museum and the Louvre. Over the past nine years we have also built up a portfolio consisting of design research, product design and development, product introductions and creative engineering for companies like office furniture manufacturer Ahrend and Marcel Wanders. lived in Saudi-Arabia, Indonesia and Singapore. Graduated from Singapore American School 1992. Studied fine arts at the Royal Art Academy in Den Bosch 1993-1995, at the Academy St. Joost in Breda at the department for architecture and interior design 1995-1997. 1998 continued studies at The Design Academy Eindhoven studying under Gijs Bakker. 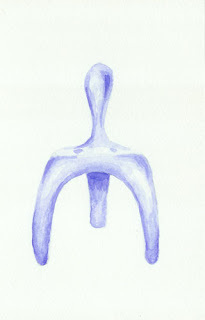 Young Danish designer Thomas Pederson really captured the look of a stingray gliding through the ocean with his Stingray chair. Doesn't it look relaxing? I have swam with them in the Cayman Islands, and it's very relaxing to watch. I even held a stingray. For the record, they are soft—like picking up a big piece of slippery Jello. 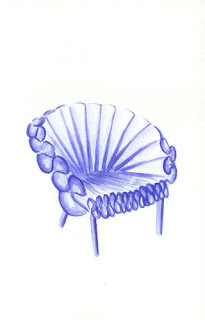 The shape of the rocking chair was partially inspired by a shell. This gives it a beautiful organic design which is raw on the outside but smooth and refined on the inside. 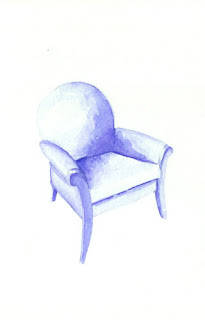 The chair provides a unique experience of inner tranquillity. The steel frame has been constructed without any transverse lines therefore accentuating the floating appearance of the chair. 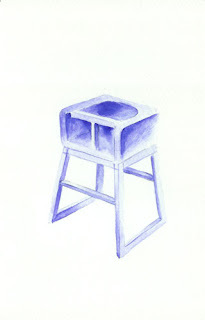 Made in Canada, this high chair made its debut at Kids Expo in las Vegas in 2009. With a solid maplewood base and easy-to-wipe recycled-leather upholstery (is that like pleather?) that comes in either black or brown. Because it pulls right up to most standard table heights and doesn’t require a tray, so your darling little child is able to get closer to the action at the dinner table and feel more included in family meals. Designed for independent sitters up to 4 years, the Tavo includes a permanent T-bar and an adjustable seatbelt to rein in restless diners. WALK. Don't WALK. Is this hip and urban or what? 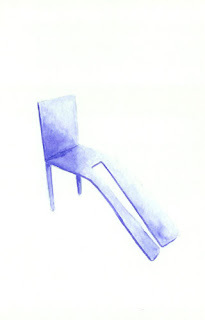 There's nothing pedestrian about this chair. Artisan John Carter combines fine art, interior design and social commentary for a truly one-of-a-kind creation. The New York City "Walk/Don't Walk" signs actually work - and a remote control is included to turn them on and off. The legs are made from reconfigured, customized steel street sign brackets, with galvanized, heavy duty self-leveling feet.The chair can come complete with all the genuine scuffs and stains of its New York City roots or can come "squeaky clean" with a fresh coat of paint.The seating surfaces have been reglazed with one inch-thick polished resin, cushioned with felt suspension. The chair plugs into a standard 115V AC outlet, and the standard bulbs (included) are replaceable. Handmade in New York City. 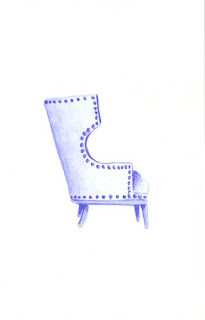 Part of a pair of chairs named the Fenella and John chairs, this whimsical chair has a cute story. 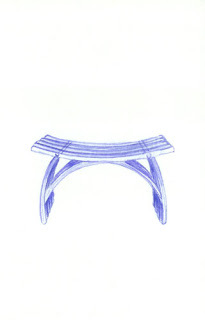 Designer David Savage was commissioned by a nice couple in Devon (UK) who wanted a pair of fireside chairs. 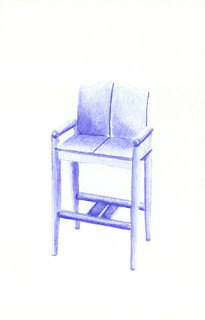 The client John said that he wanted a chair for his wife Fenella that protected her from the drafts of the door behind where the chair would sit, and would wrap around her. And he also requested "...a twiddly bit, just one, something frivolous." Too darling, isn't it? So that curlicue on the left must be the twiddly bit he asked for. 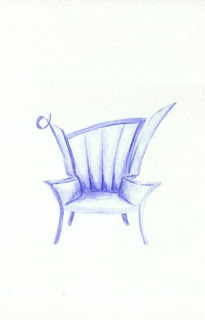 I love the inward curves of the chair arms, and the asymmetry of the right slanting swoosh of the chair back. John's chair is totally different. It is a "man's chair", all bare bones and no sissy girl cushions or padding. Okay, how sweet is this? 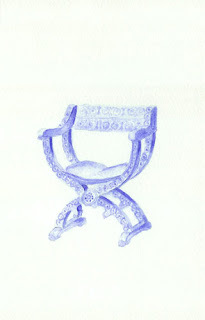 This designer created this chair for his pregnant wife! Do you love?! After looking in vain for a rocking chair that met all their criteria for good looks and comfort, Patrick decided to create one for Sophie. So he used the Fibonacci sequence to create curves on a grid. Made from one piece of moulded fiberglass, his method not only gave the chair strength in it's function, but also a sense of suspension. Rock-a bye-baby! The Fibonacci Sequence and the Golden Ratio are related, and have been around forever in mathematics and the arts—even music. Really... forever... because it occurs in nature! It starts with the number 1. Each additional number is the sum of the two numbers preceding it. For example 1+0=1, 1+1=2, 2+1=3, 3+2=5, 5+3=8 and on and on. 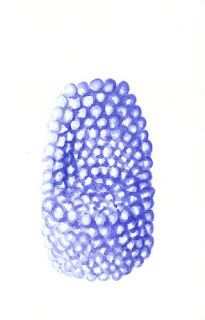 Picture the cross section of a nautilus shell, or the petals of a flower. It's too "Mathy" for me to get into in depth here. Google it! Tim Philbrick made one of his club chairs for the show. He is one of the few makers to take on the upholstered form, and his club chair was received like no other easy chair since John Dunnigan’s upholstered work in the 1980s. Philbrick had worked on the easy chair form since his PIA training in the 1970s. In the early 1980s, he was commissioned to do a series of upholstered seating pieces for the Edward Steichen house in Connecticut. 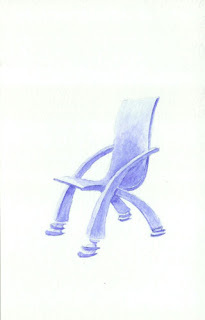 His chairs stand out today as contemporary forms in complete control of their many curving lines. In these chairs, the visible flow of the wood continues up the front leg, through the arm, up the side of the back, and into the crown rail. 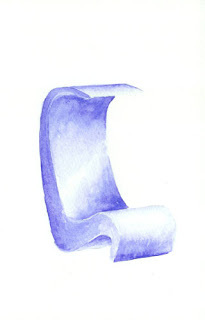 The curving front edge of the upholstered seat forms the front of the chair, without resorting to a separate cushion. Nothing says relaxation like coming home to a chair with cannons on it. Maybe if you're Horatio Nelson. 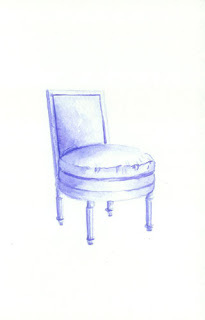 The chair is from the collection of Mallet, in London, and is a unique Regency commemorative armchair. It's carved from the oak planks from the HMS Victory, Lord Nelson's flagship that was battered during the Battle of Trafalgar (October 21, 1805). Talk about provenance! 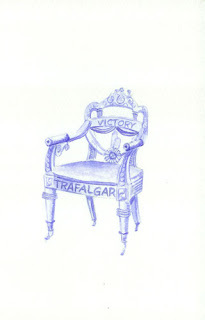 The seat back is carved with the royal coat of arms, and also carved on it are words Victory and Trafalgar, along with serpents and scrolls and various decorative carvings. Lord Nelson was mortally wounded during the battle, and he died on the deck of the Victory, becoming Britain's greatest war hero. So if he's sitting on this chair it's as a ghost. I am not making this up people! Love your style. Search for more of her creations on this blog. 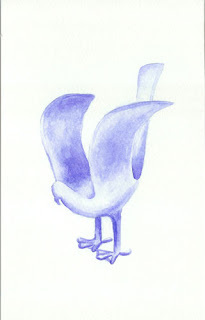 Clearly a dove with wings, but I also see a royal crown in this design, don't you? 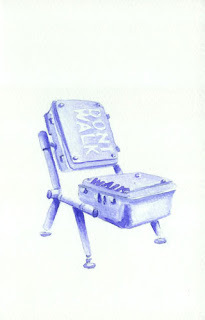 This is not to be confused with Ron's Before Spring chair, which is positioned slightly different. Ron Arad is everywhere on this blog. He's a contemporary designer who is always thinking, always full of fresh innovation. Combining playful forms and experiments with advanced technologies, Ron Arad (1951-) has emerged as one of the most influential designers of our time. Born in Tel Aviv, he moved to London in 1973 to study architecture and made his name in the early 1980s as a self-taught designer and creator of sculptural furniture. This Late fifteenth-century Genoese armchair has some gorgeous detail work. It's from L'Antiquaire & the Connoisseur, New York. 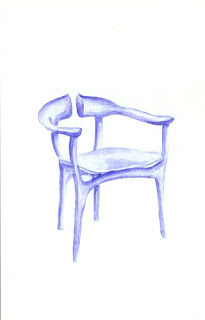 The folding "X" chair design is a riff on the classic Savonarola chair. See Chair #28, January 28 of this blog for more details. This is a nineteenth-century grotto chair crafted in the shape of the crab, and it's from the collection of Ariane Dandois in Paris. Man made grottos were all the rage back in the romantic era. Think of Mad King Ludwig and the grotto he had built at Neuschwanstein Castle in Bavaria—all part of his grand homage to Richard Wagner. The grotto was an artificial stalactite cavern, complete with a waterfall. He'd float around in a boat and crank the Wagner up to 11. 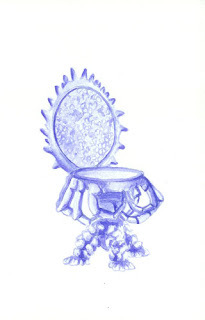 This crab chair would be absolutely perfect in Ludwig's grotto. Ahh, lifestyles of those crazy rich an famous, eh? In a large, heavy pot over low heat, melt butter; add flour and blend until smooth. Slowly add milk and half & half cream, stirring constantly with a whisk; cook until thickened. Add onion, Worcestershire sauce, salt, white pepper, mace, cayenne pepper, and lemon zest. Bring just to a boil, stirring constantly. Reduce heat to low, add crabmeat and crab roe or crumbled hard-cooked egg yolks; simmer, uncovered, for 5 minutes. Remove from heat and add sherry, stirring to mix. Let sit for 3 to 4 minutes before serving.To serve, pour the soup into individual heated soup bowls, dividing the crabmeat and roe equally into each bowl. Sprinkle with parsley and serve immediately. American designer Paul Martus creates furniture and products, but is probably best known for his unique metal works, such as the hand hammer and wrench. No really, it's a real crystal chair! 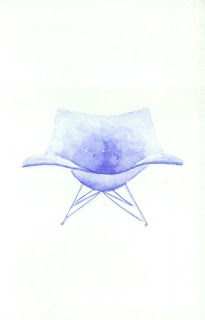 Designer Tokujin Yoshioka grew this chair using a production process that utterly unique. Not that it would be comfortable to sit in. Ouch. A fiber form made of polyester elastomer (which looks like strands of cooked spaghetti or a nest of ramen noodles) forms the skeleton which is then submerged into a tank. There the crystals slowly grow onto the fiber form. At his at ‘Second Nature’ exhibit, Yoshioka installed a large water tank to hold this submerged fiber form in water. So visitors actually saw the process of the structure growing. Well, slowly, of course. The process takes months. Reminds me of rock candy. 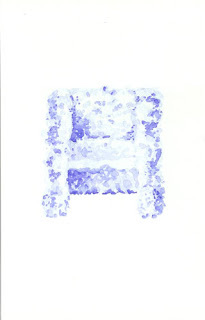 Actually, the full name of the chair is "Sculptural Japanese Chair for Sumo Wrestler." Wacky, I know. Kenmochi designed this chair as an homage to a big and beefy famous Japanese Sumo wrestler named Kashiwado Tsuyosh (1938–1996). 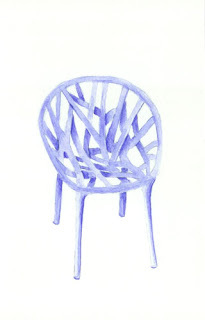 The designer took weeks to produce this sculptural chair. The wood he chose was just as important as the design of the chair. He started by cutting numerous blocks of the bottom roots from a Japanese cedar, then he carefully selected the pieces of wood with the most tree-rings. The blocks were stacked onto each-other forming layers. Suddenly I am craving sake and sushi. There's a trend on getting back to nature. Shapes from the world of vegetation serve as inspiration for brothers Ronan & Erwan Bouroullec’s new vegetal chair. Its plant like structure, like crissing and crossing vegetation, is modeled after trees in 19th-century gardens that were pruned into functional furniture. It's available in six delicious, veggie inspired colors (such as eggplant), and the Vegetal stacks away neatly.